Bruce Springsteen has announced European concert dates in conjunction with the release of 'We Shall Overcome: The Seeger Sessions.' These concerts will feature music from the new CD. There are ten shows, commencing May 5 in Dublin, Ireland, and extending through May 21 in Stockholm, Sweden. These shows follow the performing debut of Bruce Springsteen with The Seeger Sessions Band at New Orleans Jazz & Heritage Festival on April 30. Each night, an all new evening of gospel, folk, and blues will be presented by Springsteen with his 17-member Seeger Sessions Band. 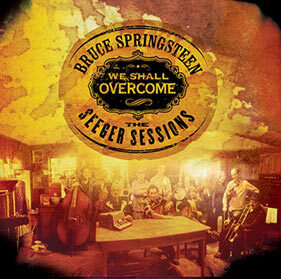 In addition to Springsteen on Vocals, Guitar and Harmonica, the European tour dates for the Seeger Sessions Band will comprise the following lineup: Sam Bardfeld (Violin), Art Baron (Tuba), Frank Bruno (Guitar), Jeremy Chatzky (Upright Bass), Larry Eagle (Drums), Clark Gayton (Trombone), Charles Giordano (Accordion, Keyboards), Curtis King (Vocals), Greg Liszt (Banjo), Lisa Lowell (Vocals), Eddie Manion (Sax), Cindy Mizell (Vocals), Curt Ramm (Trumpet), Marty Rifkin (Pedal Steel Guitar), Patti Scialfa (Vocals), Mark Thompson (Vocals) and Soozie Tyrell (Violin). 'We Shall Overcome: The Seeger Sessions' will be released by Columbia Records as a DualDisc or CD/DVD in some territories on April 25 (April 24 in Europe), with the full album on one side of the disc and DVD content on the other side. In addition, the DualDisc (or CD/DVD) package will contain two bonus tracks and a special booklet including a note from Springsteen. The album features the musician's personal interpretations of thirteen traditional songs, all of them associated with the legendary guiding light of American folk music, Pete Seeger.